After the WWII Memorial, buses took us to our second stop. The vets had a choice of visiting the Lincoln Memorial, the Korean Memorial and/or the Vietnam Memorial. Dad and I chose the Lincoln Memorial. 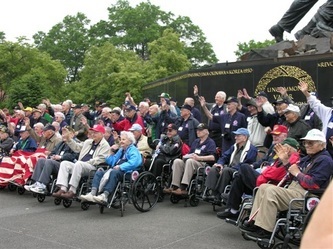 We were impressed by the sculpture of President Abraham Lincoln, the solemn inscriptions on the walls, and the view of the National Mall from the steps of this memorial. SK in light blue cap, front row, center. 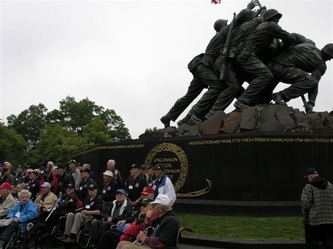 Next, our group visited the U.S. Marine Corps War Memorial, commonly called the Iwo Jima memorial because it depicts the famous flag-raising at that strategic island. As you move around to the right of this massive bronze sculpture, an optical illusion makes it seem the flag is being raised; the flagpole looks slanted at first but gradually assumes a straight up-and-down aspect when viewed head-on. At our final stop in D.C., we were privileged to watch the changing of the guard at Arlington National Cemetery. 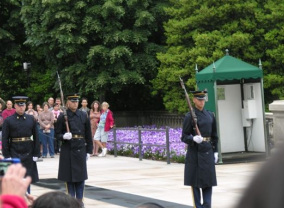 The Tomb of the Unknown Soldier is guarded at all times. 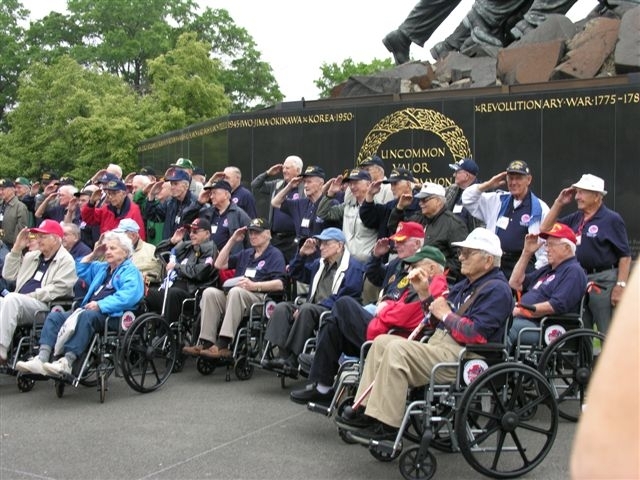 The guards are enlisted men who volunteer for this privilege or are recommended by others. In recent years, the guards twice received permission to "stand down": once during a hurricane, and again years later during a blizzard. Both times, they refused the offer to stand down, preferring to remain at their posts.